2017/18 Kaisercraft Design Team Application. 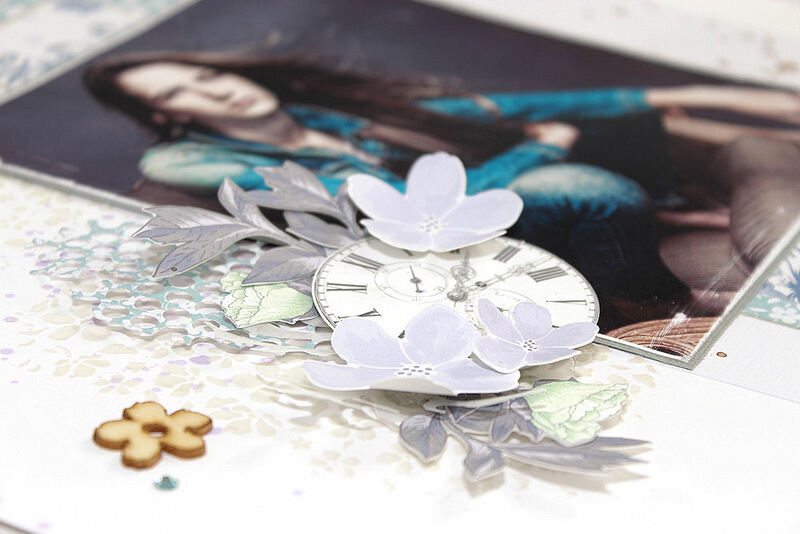 Hi everyone…as a new month dawns let me introduce you to the yet to be released Kaisercraft Collection Lilac Whisper, available in July only. 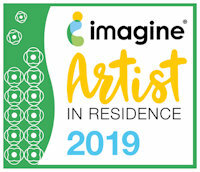 Why did I get to work with this stunning collection now, well because I am ecstatic to announce that I made it through to round 2 of the Kaisercraft Design Team application process. 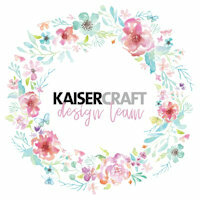 Everyone knows what an amazing brand Kaisercraft is to work with and for, and it would be such an honour to design with their amazing products. I love how you can layer and cluster the Collectable elements together for a stunning grouping with just the right amount of dimension. So the layout morphed and merged and became a storage item recycled from an empty paint tin. 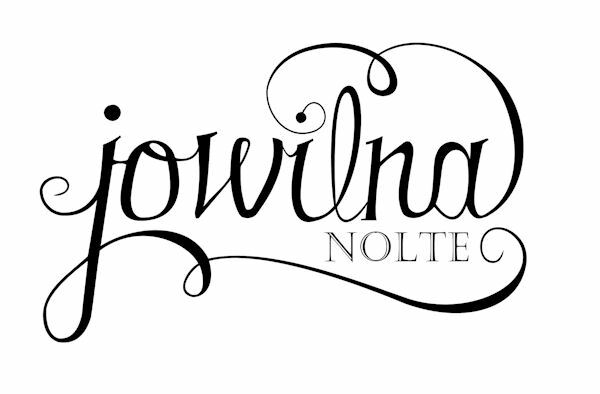 beauty of this lovely range – and it is definitely true to my style. 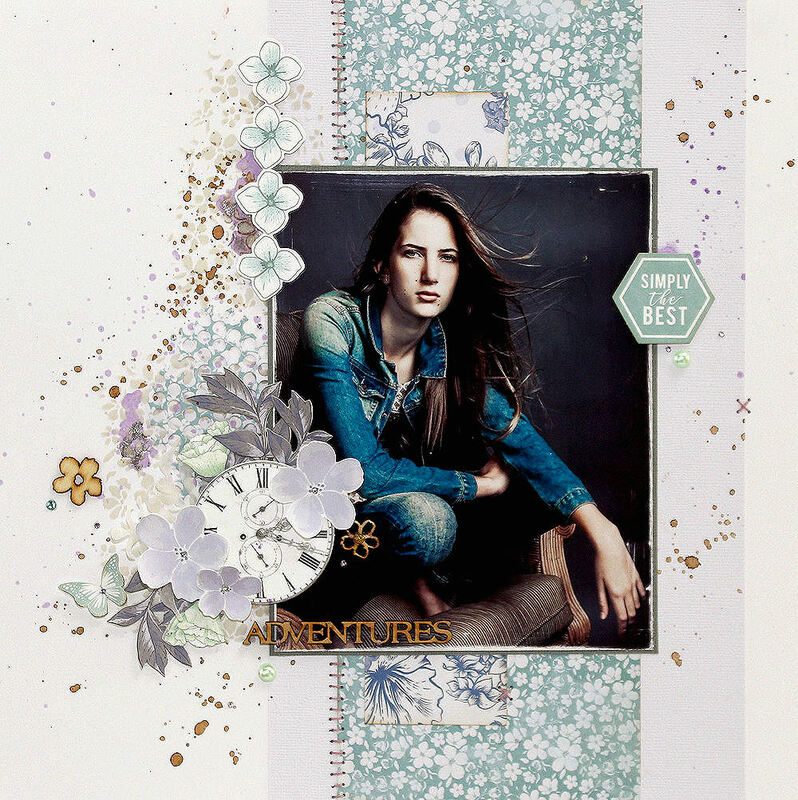 Turning scrapbooking product into something unique, combined with my home decor and painting adventures – this truly is the perfect way to craft. 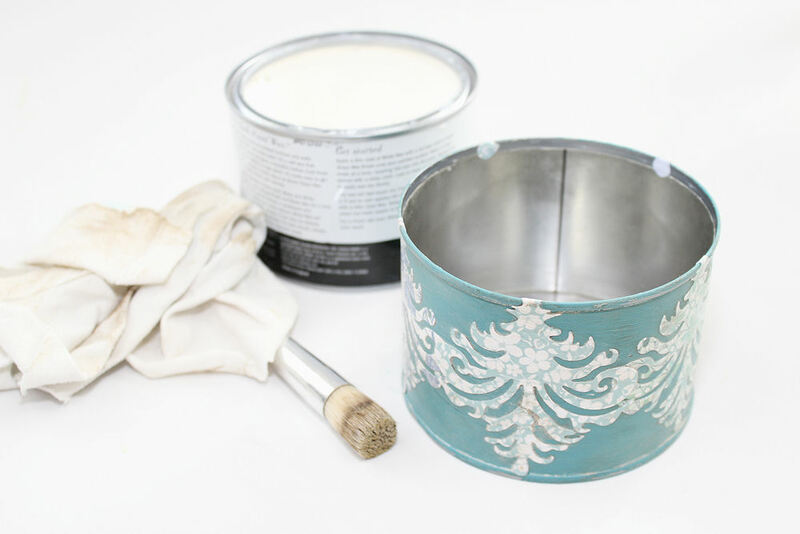 step 1 – Clean an empty paint tin and then paint the outside using chalk paint. I chose this turqoiuse colour, a perfect match for this range. 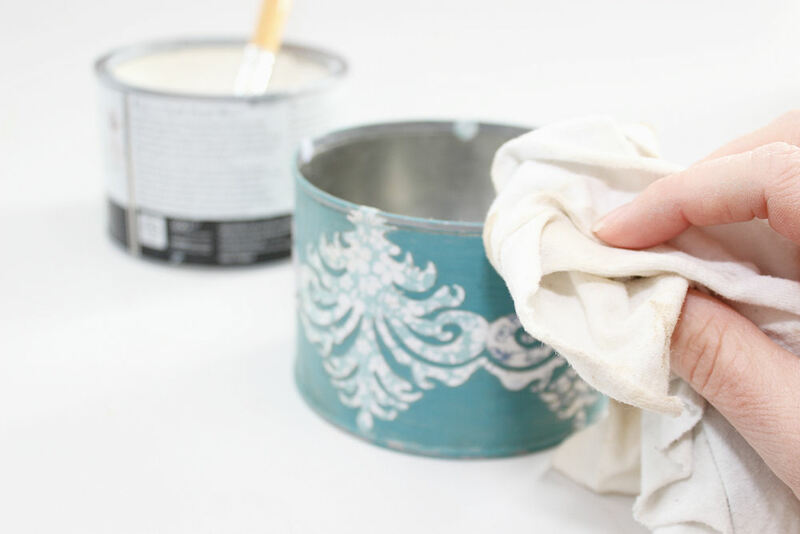 Once the paint is dry, lightly sand the surface to remove some of the chalk and create scratches and texture. 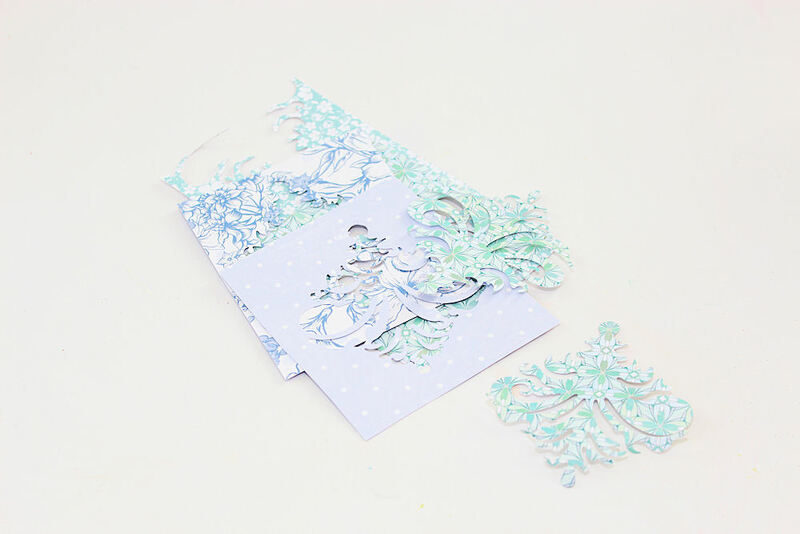 step 2 – Die-cut a shape out of some of the patterned papers using any die-cutting machine like your Silhouette. I chose this shape because it look very similar to the pattern on the “Mist” sheet which I really love. 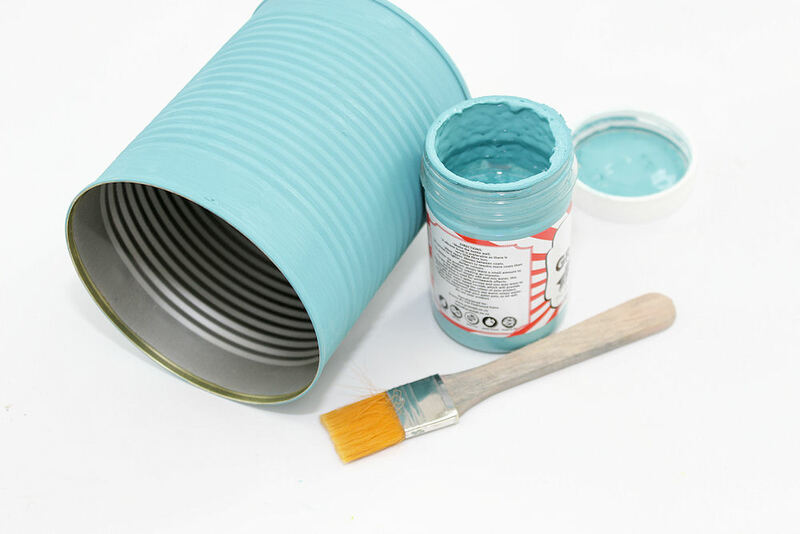 step 3 – Adhere the shapes to the outside of the tin using gel medium. First paint a layer of gel medium onto the tin, then position the shapes, and then seal them with another layer of gel medium. Leave to dry completely. 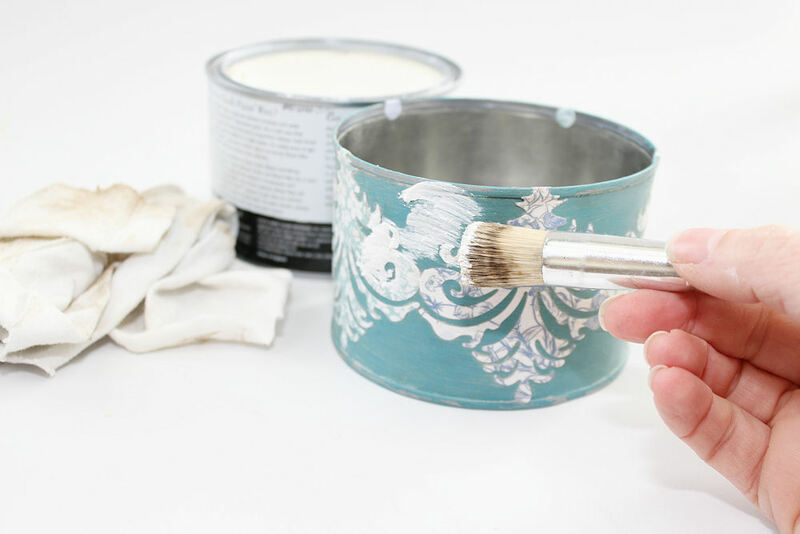 step 4 – To make the paper last longer, and waterproof the tin I cover the outside with a layer of furniture wax made for chalk paint. step 5 – Use a stipple brush to add white wax to the entire surface. Rub the wax into all the scratches and all around the paper shapes. step 6 – Use an old t-shirt or soft cloth to buff the wax to a nice shine, working the wax into the paint. The wax forms a waterproofed layer over the paper making it durable and long lasting. 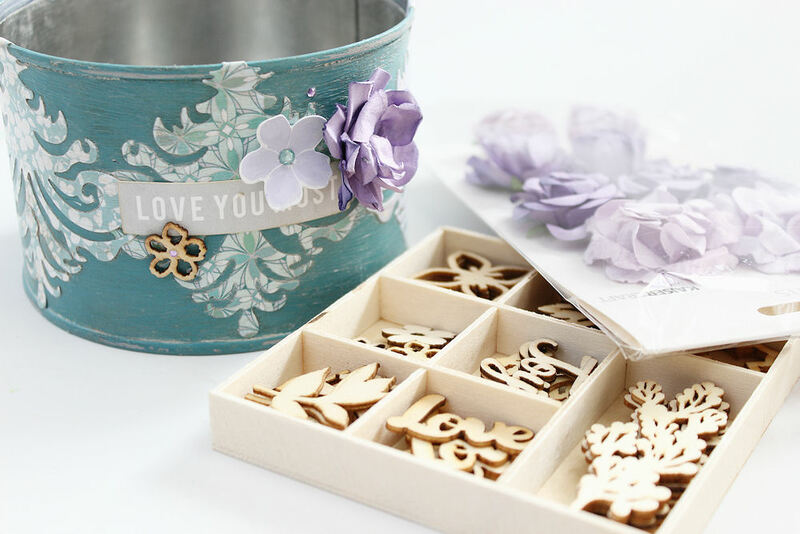 step 7 – Use your wooden embellishments, flowers and cardstock die-cuts to decorate the front of your tin. 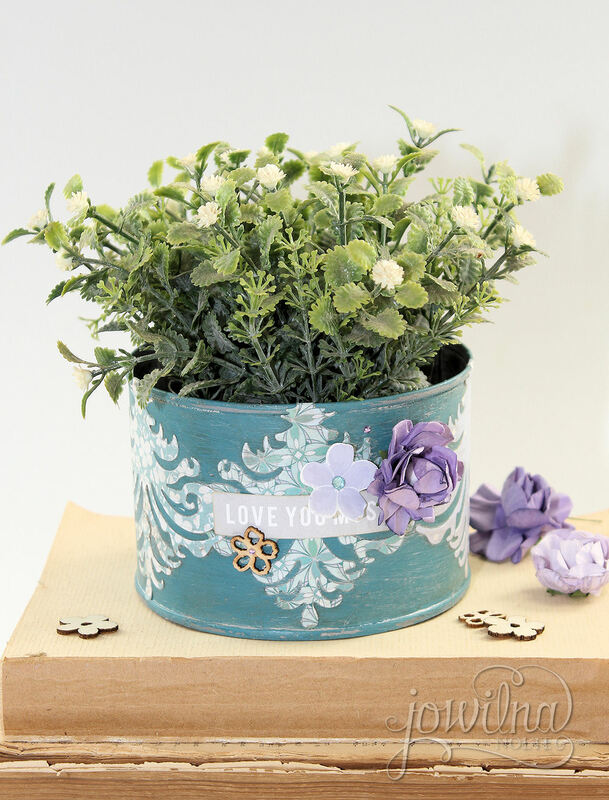 I love the combination of wooden flowers, paper and cardstock combined with the paint. Its a feast of texture and patterns. Notice how the white wax sits inside the texture on the paint and around the paper die-cuts. The paper gives a softness to the otherwise industrial feel of the metal tin – making it a perfect combination for industrial chic. 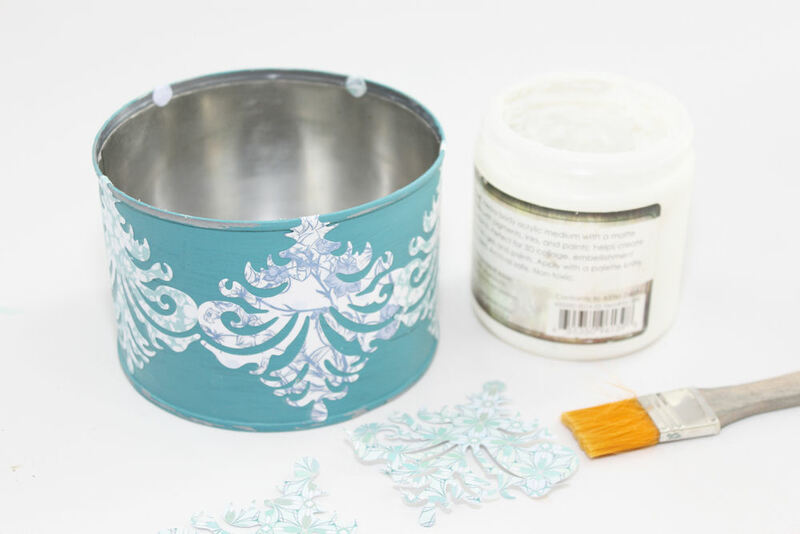 I am sure I can find a few more empty tins to decorate using the same paper range – and they would be perfect for some storage on my work table. The colouring is just perfect – tranquil and serene. 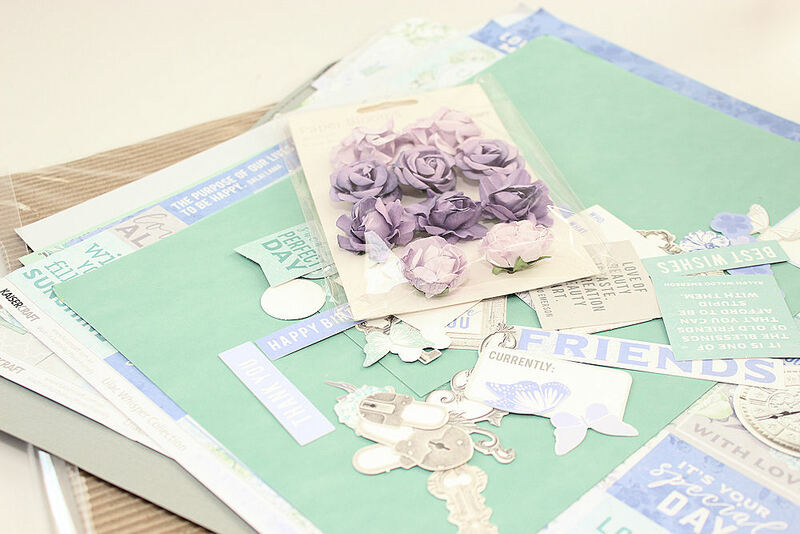 Keep an eye out for all this Lilac goodness coming to a craft store near you in July. Other: Texture Paste, tin, chalk paint, wax, old cloth, stipple brush, diamante.